Abu Dhabi: The UAE outperformed big hitters including the UK and Germany at the 2011 Stevie International Business Awards. Local business collected 24 Stevies, good enough for third place behind the US (42) and South Korea (29). British companies won 22 awards, while German organisations came away with ten gongs. Shaikha Lubna Al Qasimi, Minister of Foreign Trade, said the achievement underlined the country's competitive and unique business climate. "The attainment of these rewards reflects the government's sound strategy to support local businesses, encouraging continuous development, advancing the country's competitiveness, and ensuring that national companies are adopting the best commercial practices that are compatible with local, regional and international markets," she said. Categories included Management, Company of the Year, Customer Service, Human Resources, Information Technology, Marketing, New Products, Public Relations, Businesswomen, Website and other media awards. During the ceremony, held at the Emirates Palace Hotel in Abu Dhabi, Stevie Awards president Michael Gallagher said as many as 3,000 nominations were assessed by a panel of judges as the awards grow in popularity. Abu Dhabi Airport Company (Adac) won gongs for Best Home Page, Best Overall Web Design, and Best Corporate Event (for Formula One 2010) and also won two honorary recognitions for Best Online Press Room and Best Support Department of the Year. Khalifa Al Mazroui, chairman of Adac, said in a previous statement: "It is always a joy to have the dedication, perseverance and hard work of all Adac members recognised and rewarded by peers in the business community." He added: "Every employee at the company is committed to excellence and top quality service to meet the changing requirements of businesses and travellers, so as Adac airports grow and develop, we look forward to more awards in years to come." 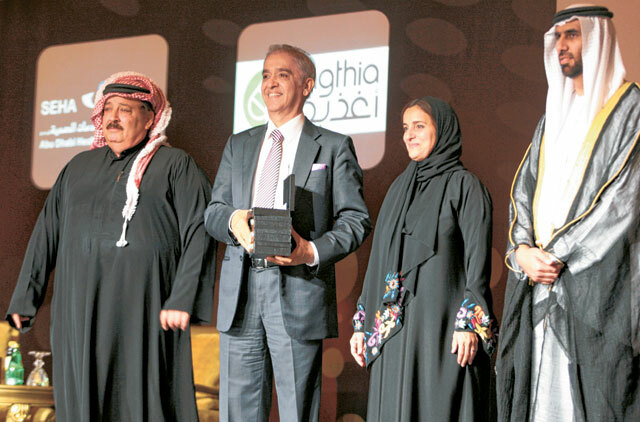 Abu Dhabi-based Al Fara'a Construction and Industrial Group won six awards. Their president and executive chairman, Dr J.R. Gangaramani, told Gulf News that the Stevie Awards were a challenge for all companies, particularly in difficult economic times. "Since we won the award last year, it was much more difficult for us to keep the same level or to improve and upgrade our performance," Gangaramani said. "In hard times and during recession, it becomes very difficult to achieve and keep high quality standards, yet we managed to do that because without this you cannot compete in the market." He added that the Stevie Awards provided "us with great confidence and will guide us more towards achieving better standards for the future". Sunil John, CEO of ASDA'A Burson-Marsteller, said: "This is a tremendous moment in the 11-year history of ASDA'A Burson-Marsteller, which provides global validation of the energy, dedication and commitment of the agency in meeting the evolving needs of our clients across a broad range of sectors and geographies." Vikram Krishna, Head of Group Marketing, Emirates NBD, said, "It is a recognition of the effectiveness of our brand strategy and an important step forward into the international arena. Our efforts at building the leading banking brand in the region have succeeded in positioning Emirates NBD on par with brands of international distinction." Sri Lanka Smart Media chairman Vijith Kannangara told Gulf News the awards are a benchmark in business performance. "We have branches in five countries in the region and in Sri Lanka and we will set up one office in Abu Dhabi because the region lacks companies which are specialised in preparing companies' annual reports and any other related matter," Kannangara said. Best Software Design: Dudu Communications Fz. LLC. American businessman Michael Gallagher conceived the idea for the Stevie Awards as a way to recognise good business leaders and "restore public confidence and investor trust" in the wake of the Enron scandal. Gallagher left his job in 2001 and founded the American Business Awards to administer the Stevies. The Stevie Awards were created in 2002 to honour and generate public recognition of the efforts, accomplishments, and positive contributions of companies and business people worldwide. Beginning with the American Business Awards in 2002, the International Business Awards were added in 2003 and the Stevie Awards for Women in Business inaugurated in 2004. The mission of the Awards is to raise the profile of exemplary companies and individuals in the press, the business community, and the general public. In September 2002, Paul Tharp of the New York Post called the Stevies "the business world's own Oscars".